The following article is by Mohammad Ehsan of Blackburn Cupping Clinic, a male and female team of Hijama Therapists in Blackburn England. alth needs of the local community and surrounding areas and the co morbidities that exist. As healthcare professionals we encounter many patients on a daily basis who suffer from chronic diseases, often multiple illnesses and patients who are on a variety of medications. These patients have often seen specialist services yet are still troubled by ill health. 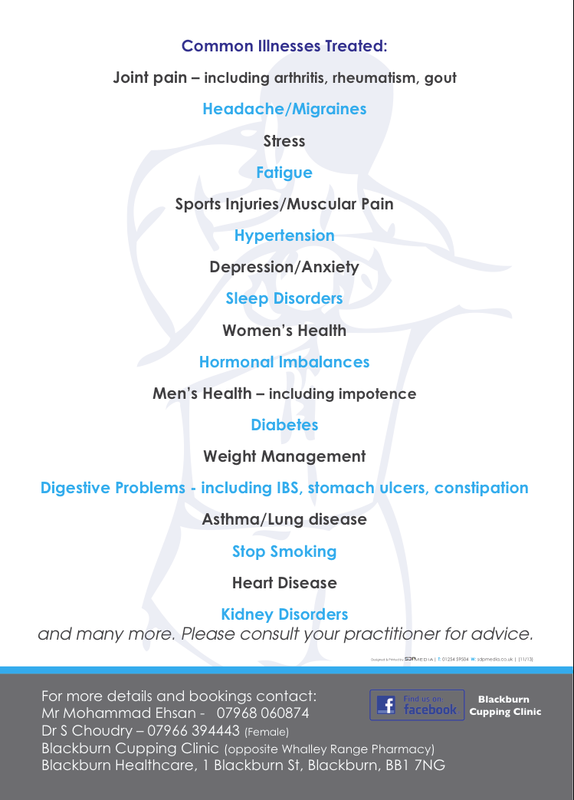 We have found that these patients are seeking alternative treatments for their illnesses to provide relief from the symptoms which have a huge impact on their daily lives. With this in mind Blackburn Cupping Clinic located at Blackburn Healthcare, 1 Blackburn Street, was established. Having researched different types of therapies, Cupping stood out as a viable alternative to conventional medicine. Cupping is a well known therapy which has been practised throughout the ages. It is a popular form of traditional Chinese medicine. 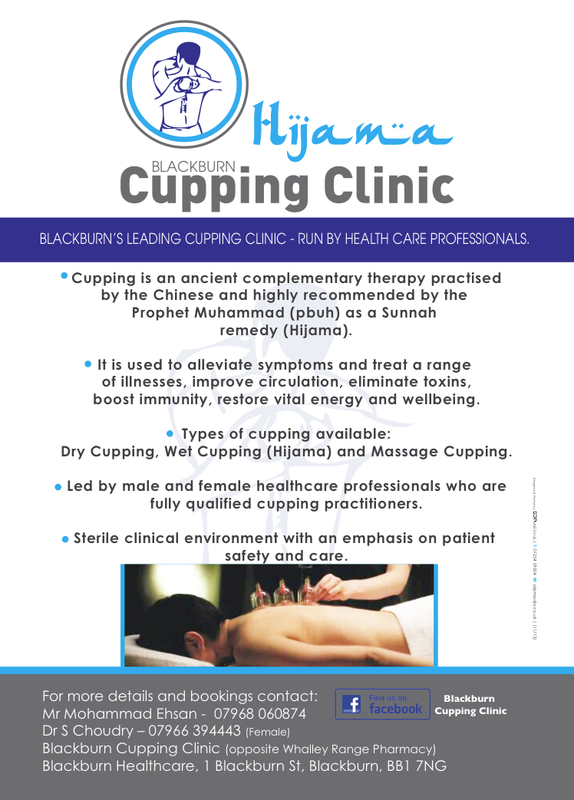 In Islam, Cupping/Hijama is a valued Sunnah remedy which was undertaken by Prophet Mohammed (pbuh) and was highly recommended as a treatment for all diseases. There have also been various medical studies carried out which have consistently shown that cupping is an effective treatment for many ailments. headache, women’s problems, IBS/stomach ulcers, hormonal imbalances, men’s health, depression, skin disease, asthma, weight management and so many more. It is a natural form of pain relief, promotes blood circulation, boosts the immune system and improves physical and psychological wellbeing. At Blackburn Cupping Clinic we maintain high professional standards, focusing on patient care. We operate in a purpose built clinic, with strict emphasis on hygiene and clinical safety. Blackburn Cupping Clinic prides itself on its first rate, friendly service at very competitive prices. We are fully qualified Hijama Practitioners with the additional advantage of being experienced healthcare professionals, providing tailor made consultations and treatment plans as well as providing aftercare to give our patients the best possible results. It is so fulfilling to put our years of medical experience to use within the local community and offer a sought-after therapy with successful results. Our thanks to Mohammad Ehsan of Blackburn Cupping Clinic for sharing the above post. If you have any questions or want to leave some feedback, then please do so via a comment* below.